Southern Belle, one of the leading savannah vacation rental companies offers Parlor on Park, one of the most gorgeous traditional southern homes as a vacation rental option for visitors to this the oldest city in the state. Savannah Georgia is like the soft morning breeze, gently caressing your cheek as you drink that hot cup of morning coffee. The Savannah GA historic district is so deeply southern that it leaves visitors enchanted. However, many visitors to this area feel that hotel accommodations just don't help capture the essence of the area; so instead they prefer one of the Savannah GA vacation rentals as these are usually traditional Savannah GA historic district homes. These Savannah GA vacation rentals offer beautiful accommodations that embrace you in soft comfort and luxury. That’s exactly what makes Parlor on Park one of our most prized Savannah GA vacation rentals. Park Place Manor offers deep southern comfort in a 2 bedroom, 2 bath with a richly traditional wrap around veranda, and best of all, it’s just a few blocks from the famous Savannah GA historic district. Parlor on Park is wonderfully located, just a few steps away from Forsyth Park, a gorgeous walking park with overflowing fountains, huge draping trees, and gorgeous marble and granite monuments. A house that is truly reminiscent of what the old South really was. This is one of the Forsyth Park homes where you can picture yourself as The Scarlett O’Hara or Rhett Butler in the movie “Gone with the Wind.” Certainly this is a rental property like none other. It is incomparable to that of other Savannah Vacation rental companies. Aside from being fully furnished and equipped in the traditional southern old-word style, it is administrated by Southern Belle, one of the few Savannah vacation rental companies that make southern hospitality a key factor for guests. It is our service, offered information and additional concierge services that make all of our Savannah GA vacation rentals extremely popular for visitors. The last thing you want when on vacation is to drive long distances, so you want to stay as close to the historic district or to Forsyth Park. So when it comes to Parlor on Park, you can’t go wrong. This home has a fabulous location, one your family and friends are sure to enjoy whether you’re visiting Savannah for pleasure or business. This home is beautiful, but more importantly it’s within walking distance of the Savannah GA historic district, yet still off beat enough to allow you to enjoy the quiet neighborhood, the greenery of the park and beautiful breezy evenings out on the veranda. Walk out your door and you can stroll through the cozy, romantic tree lined streets of Savannah. But that’s not all that’s close by – just walk a few more blocks and you’ll come to the renowned Savannah GA, historic district where you have an extremely varied choice of restaurants, shops, and cafés as well as more than a few night venues. Stop in at one of the local outdoor cafes or head over to Leoci’s for lunch; you'll love the outdoor veranda and Italian Fare. You'll also want to try the Mansion on Forsyth for dinner. This is actually an old Georgia mansion turned into an elegant southern restaurant. In the morning stroll over to one of the local outdoor coffee shops for a steaming cup of brew. And if you feel like trying your hand at a gorgeous meal from the fully-equipped kitchen, the organic food market is just outside your door. This is a two bedroom, two full bath gorgeous Forsyth park vacation rental. Upon arrival you’ll notice the traditional southern style architecture with a beautiful walk around veranda; the perfect place to sit in rocking chairs, drink some southern style tea and have a nice chat. Walk in the front door and admire the open living space, deep cushiony leather arm chairs and sofa; wonderful for taking naps or spending time together. This offers the perfect cozy environment for romance, reading a book or simply having a bit of quiet time. But if entertainment is the name of the game, then you’ll love the living room’s large screen flat TV. 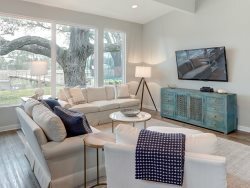 Of course, even while on vacation, you probably can’t simply disconnect from everything, that’s why this is one of the few savannah vacation rental companies that ensures that every home rental option has cable TV and Wi-Fi connections. The staff were extremely responsive and courteous. Great place, great location. We would stay here again. Everyone was very pleasant, prompt and helpful. Southern Belle Vacation was my first experience at renting a home. They were very prompt and organized. It was so easy!! Everything was ready when we arrived. It was so pleasant when we arrived after traveling for 18 hour to walk in and the lamps had been turned on so we werent walking into a dark house. Thank you for everything!! Everyone was amazing. From updates in regard to Hurricane Florence to reminders about check in and check out information. Both my mom and I were thoroughly impressed. Even under the beds was spotless. Every thing one might need was thought of. While we didnt need as big of a place that I booked for only two of us, it was the perfect getaway for two busy gals who never have time to just focus on themselves. Absolutely LOVED Parlor on the Park. Perfect location and exceeded my expectation. The house was beautiful! Also, it was very close to a coffee shop and a natural food store which was very convenient. We had a lovely time in Savannah. The property was well situated and very clean. Very helpful from start to finish. You can talk to a person and get a response not an email. Excellent service all around. Southern Charm. Close to Welcome Center and restaurants and parks. Loved the area along with the Charm of the old home. Yes, there were a few things that needed tending (porch railings) but all and all great rental for the price and location. Excellent company to deal with from start to finish. Great followup once you check in. No issues. Would stay her again.